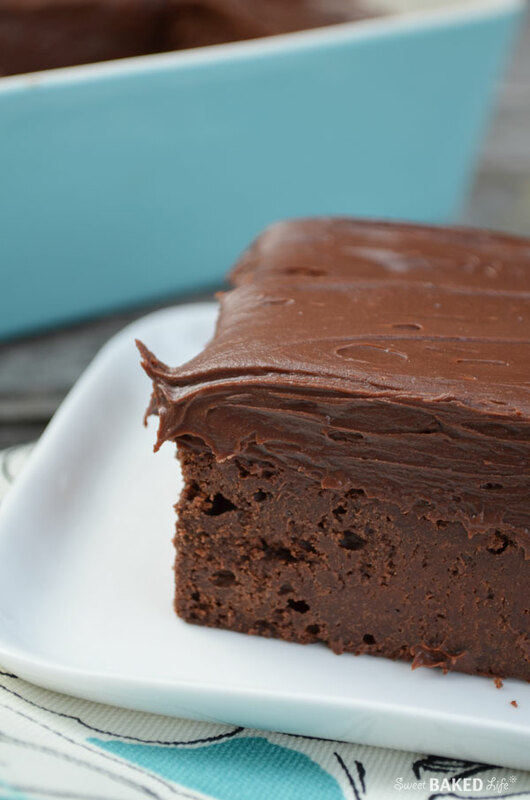 Decadent, dark and darn delicious, this Cold Chocolate Fudge Cake is like a big, thick brownie frosted with chocolate ganache! Did I say divine? Well, I should have! Because this cake is all that and out-of-this-world I-N-C-R-E-D-I-B-L-E!!!! For some reason, I seem to be on a chocolate kick these days! Not really sure why as I usually mix things up a bit. Must be the chocolate that runs deep in my veins. You see, I have always loved chocolate, ever since I was a little girl. Forget eating dinner; I was not hungry for that! But when it was time for dessert, well for some reason I miraculously was ready to partake! One of my best memories of chocolate includes going to our local ice cream store and ordering my favorite – mint chocolate chip ice cream dipped in rich, chocolate that instantly hardened. Ah, yes, I am still in-love with that chocolate sauce that hardens to silky perfection as proven by the fact that I learned how to make it here. My chocolate obsession is also evident by my recent posts which include these scrumptious Skillet Cocoa Brownies and this fabulous Chocolate Malt Layer Cake. Both were darn delicious, but nothing really prepared my taste buds for this sinfully good, Cold Chocolate Fudge Cake. I instantly fell in love after taking my very first bite of this cold cake! 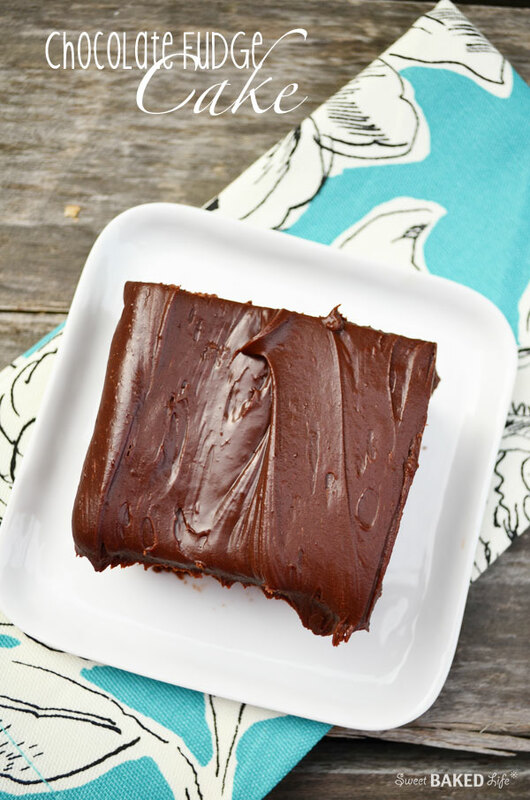 You start by making a brownie-like cake layer then top it off with thick, glimmering chocolate frosting! 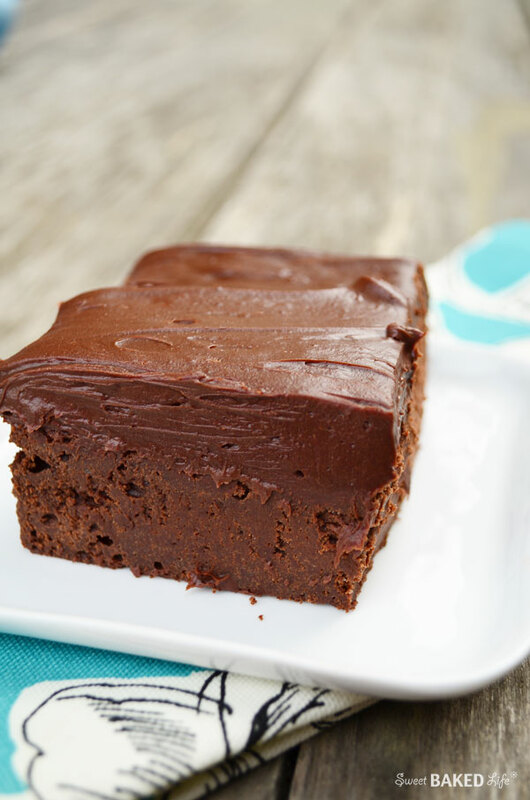 The moist, dense cake texture combined with the silky frosting — ah, don’t think I need to say more! So chocolate lovers, get swept away into the best chocolate dream you could ever imagine and you’ll have pure, sweet chocolate pumping throughout your body in no time! And guess what? Even my family loved this cake! Yes, my two very picky guys said it was really good; rich, but good. In my book, that’s a compliment. Yeah, hard to believe that these guys turn down most of my sweets — my office friends thank me again and again, as they are ever so happy to gobble up the unwanted “leftovers”!!! I sliced large pieces of this cake when I took the photos, however my hubby proceeded to let me know, that you really only need a small piece of this dense chocolaty goodness. A little chocolate love goes a long way! Well, I personally could not stop eating it — right out of the pan in the fridge, I might add!!! Cold and oh so good! Heat your oven to 350 degrees. Prepare a 10×8-inch or 10×10-inch baking dish with non-stick spray and set aside. In a medium bowl, add the cocoa powder, flour, baking powder and salt. Whisk until combined. In a large bowl of an electric mixer with the paddle attachment, add the butter and sugar and beat until light and fluffy (about 2 minutes). Add the eggs, one at a time, beating to incorporate. Then add the vanilla and blend until well incorporated. On low-speed, slowly add and mix well after each addition, 1/2 of the dry ingredients, sour cream, then the last 1/2 of the dry ingredients. Note, the batter will be thick. When your cake is cool, add the chocolate chips to a medium-sized glass bowl. Heat the cream in a small pan over low heat on your stove. Once steaming (note, do not let come to a boil), pour over chocolate chips. Let sit for 5 minutes, or until all the chocolate is melted, then whisk to fully incorporate the chocolate and cream. Add the sugar and cocoa and whisk until smooth. Using a spatula spread the frosting over the cake. Put the cake in the refrigerator for about 2 hours or overnight. Slice with a sharp knife and serve cold. Store cake in refrigerator. 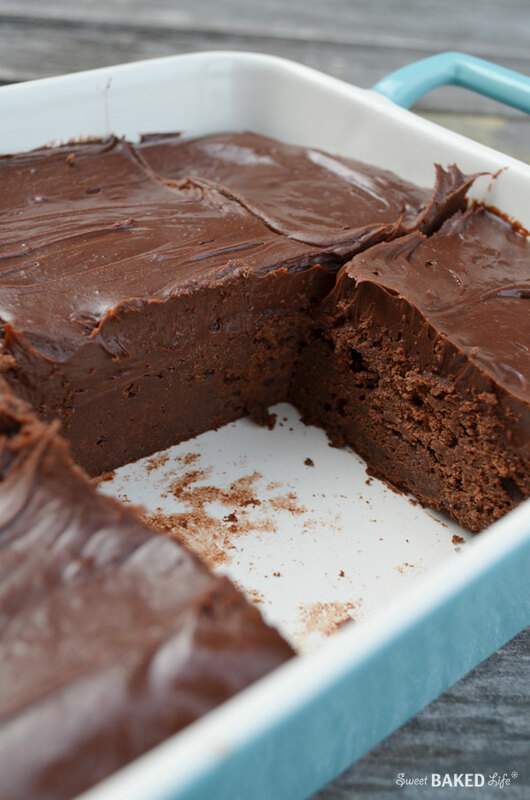 This Cold Chocolate Fudge Cake is the perfect snacking cake! Be warned, a little bit can go a long way! Thanks mom, and tastes even better!!!!! I wish I was one of your office friends Sheila with treats like this! Ummm… This looks incredible! …What in the world!!? Love it!